This week at work, we produced our 50th lot of antiglobulin control cells. It’s a week-long process, from testing red cells to treating them, diluting them, putting them into little vials, and labeling and inspecting them before getting them ready to ship out. Everyone here has a hand in the process, and so we all feel connected to the product. I decided that 50 was a big and important number, and that it called for celebration. When in doubt as to choosing a way to celebrate, the answer is usually cake. I took a plunge into real baking and made this cake completely from scratch. It’s something I’ve been wanting to try for a long time, but I’ve been intimidated by the process. It just seems so complex and touchy, especially when compared to the three easy steps involved in a Betty Crocker cake mix. But, a cake was needed, and what better time to finally just go ahead and try something new? The year’s nearly over already, and since “bake a cake from scratch” is on this year’s list of goals, it had to happen sometime. I asked my sister-in-law (link goes to her blog) for some help choosing an idiot-proof recipe for both cake and frosting. She’s been making tasty from-scratch cakes forever, so I figured she had enough experience to know which recipes may be unrealistic for a beginner like me. On her recommendation, I made Hershey’s “Perfectly Chocolate” chocolate cake, and topped it with an “easy vanilla buttercream” icing. The cake was a matter of measuring everything into my stand mixer and then pouring it into pans, not very much different from what I would have done with a box cake, except that I had to measure more things out. 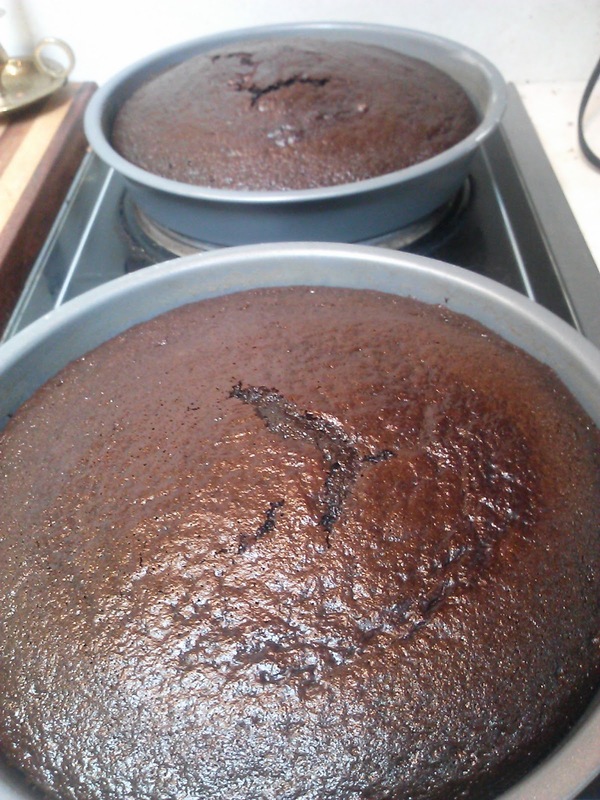 The final batter was extremely thin – the website warned me about that, but as I was making the cake, I hesitated. It was already looking very runny, and then I was supposed to mix in a whole cup of boiling water. I did as instructed, but the result was the consistency of tomato soup, and I was sure I’d done something horribly wrong somewhere. Despite my misgivings and my many peeks into the oven to see if it was still goo, it baked up just fine into actual solid cake. Hooray! While the cakes cooled, I made the icing. I took the sticks of butter, which had been on the counter all day to soften, and dumped them into the stand mixer’s bowl. When I tried to fluff the butter with the whisk attachment, the machine shuddered and wobbled, so I stopped it in a hurry. When the thing stopped, I saw my problem: a solid ball of butter lodged inside the whisk. I guess “room temperature” did not equal “soft” on this particular day. I poked the handle of a wooden spoon between the wires of the whip and dislodged the butterball one chunk at a time, scooping the chunks into a measuring cup. Once I’d gotten most of it, I microwaved the measuring cup so the butter would be of a more whiskable consistency. The finished icing looked and tasted great, but it needed some color. I wasn’t making a white blood cell! Again on my sister-in-law’s advice, I’d picked up some Wilton gel food coloring for this project. Because red takes so much dye to get right, a gel works much better than the liquid color and doesn’t dilute the icing. I picked “no taste red”, thinking that maybe the others had a weird taste to them, but it turns out that this shade doesn’t really go to true red. It was more of a pinky coral color. Still very nice, but not the bright oxygenated hemoglobin I was going for. I ended up using almost the whole jar. I used a small paring knife to cut away an indentation on the top of the cake, because red cells are biconcave (dimpled on both sides), and I was going for realism. Or as much realism as an amateur baker and decorator could get out of buttercream and cake, anyway. 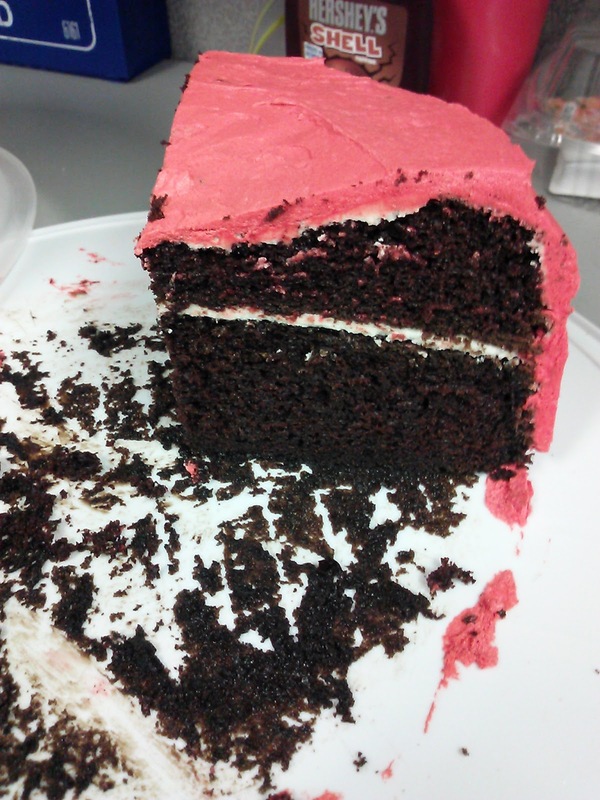 This also gave me an opportunity to sample the cake before inflicting it on my coworkers. I was quite relieved to find it delicious. Looks pretty good, even naked! Here’s the finished cake just before I covered it up to bring it to work. You can see that the red didn’t really come out right, and I’m a little grumpy about that. 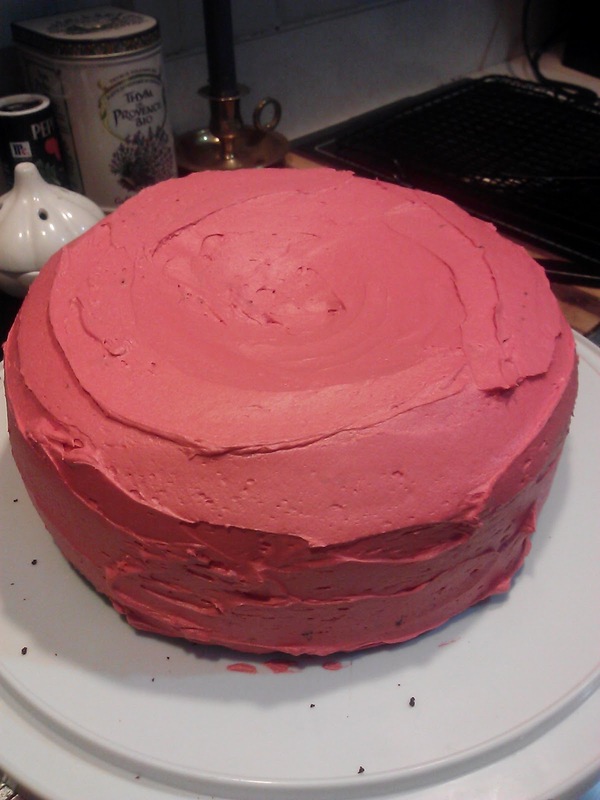 Also, I tried and tried to make the icing smooth and flat, but all I had to work with was a small offset spatula. I think I’d need some fancy cake tools to get it right, but I’m not sure I’ll do this often enough to invest in those. If my coworkers were disappointed in the color or outer texture of the “red” blood cell, they didn’t say anything. The cake disappeared in record time. Yay! Total cake success and I can cross something off this year’s list of accomplishments! This entry was posted in Uncategorized on November 16, 2012 by antijen. I am also trying to make a “blood cell” cake for work and came across your page. Add quite a lot of the Wilton Gel and it will eventually go red, don’t be afraid to glob it in. Also, it darkens with time so if you mix it up the day or two ahead of when you need it, it will be fairly intensely red by the time you need it. Also, I do my “rough” icing, like you have it here and then stuck my cake in the freezer for about half an hour. Then, using my offset spatula (like yours) I would run it under hot water and just careful smooth it out touch by touch. Good on ya for being so creative and I hope this helps! Thanks so much for your suggestions! That was my first time using gel color, and I had no idea the color would darken as it sat there. Lesson learned for next time! I hope your cake turns out great, and I’d love to see it!